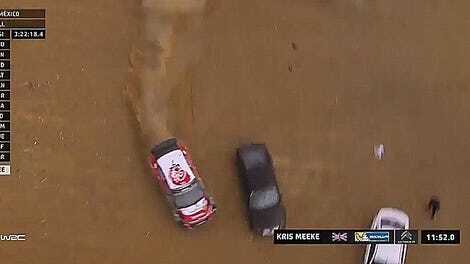 World Rally Championship fan Jiří Tureček happened to be in the right place at the right time after Toyota driver Juho Hänninen hit a bridge near the end of Stage 1 of this weekend’s Tour de Corse. The hard hit caused fuel to leak out, which sparked a weirdly mesmerizing fire when viewed in slow motion. Hänninen lost 14 minutes to putting out the fire and ultimately ended up retiring from the rally after the first stage, reports Motorsport.com. Perhaps he discovered then that things were a bit too torched to go on. Still, it’s a real testament to the idea that rally drivers will keep going through nearly anything that we’ve got this weirdly beautiful slow-mo footage of a Toyota Yaris WRC car still pushing on while on fire.